We emailed Hussein Amoodi to see if he can arrange for an email interview with Todd Loffredo. The great news is that Todd has graciously agreed to do this. And here's THE Interview. 1. What do you recommend a player who is just starting out practice? ANSWER: Ball control.. Lots of it.. Learn to do circles with the ball and to tap the ball from man to man and to catch the ball from side to side smoothly without tapping it. To pin the ball from man to man in the front pin and the back pin.. To weave the ball on the five man like this.. Starting from the first man going toward the far wall push the ball towards the second man and let the ball go behind the second man and in front of the third man and behind the fourth man and in front of the fifth man and then reverse it.. Then when you get bored with that, practice tapping the ball on the five man with different patterns starting with the 1 or first man on the fiveman..1-3-2-4-3-5 or 2-1-3-2-4-3 and so on.. Use your imagination.. I use to practice like this often and it is great for your control and will help you later when you want to learn new things and also helps make you smooth. 2. If you had a player asking you advise about going PRO, what would your advice be to him? ANSWER: Practice like a Doctor that is practicing medicine. often and with discipline..
3. 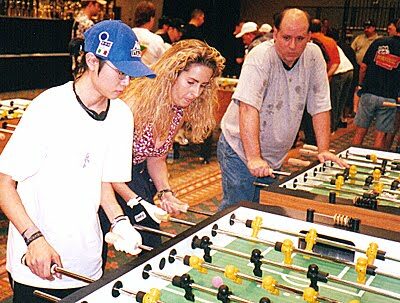 Finally what is your favorite thing about foosball? ANSWER: The first thing is obvious.. Winning because winning is always fun, especially when you win with someone. But also friends that I have met through the game..
1. 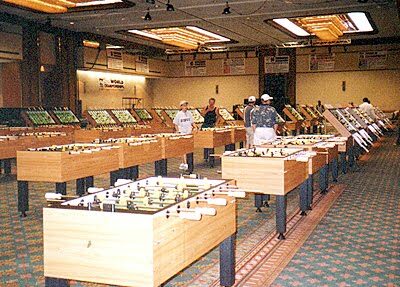 In your foosball career, what is your single most satisfying and proudest achievement? ANSWER: Its hard to say because it always seems that the most satisfying achievement is the one I am always working towards or have finally achieved.. The Proudest is probably the 1977 Tournament Soccer World Championships because no one knew me or expected me or my partner to win.. They all just kept asking: who are those two kids? So it was special for me because it was my first..
2. What is your all time favourite movie? LOL..
2. Raiders of the lost Ark. 5. All Star Wars and Star Trek movies..
1. What is it like to be a living legend and actually have a shot named after you? Note: The rolling Pull shot is called a "Loffredo" in Malaysia. 2. 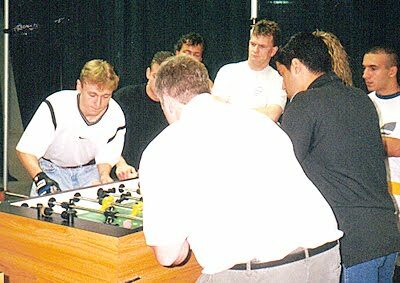 What is the absolute craziest thing you ever seen at a foosball tournament? ANSWER: There are so many. I have seen bad and good things. 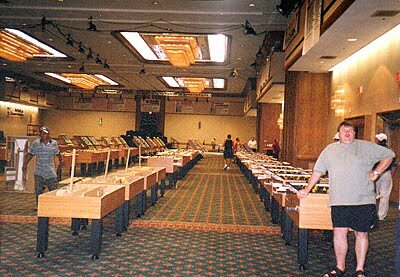 I remember a tournament in Cincinatti a 50,000 super singles tournament on Tournament Soccer and 2 round in singles Paul Reynolds a Columbus Pro had Dan Kaiser who was an old great player in the late 70's anyway... He had him 2 games to 0 and 4-0 in the Third game.. Dan Kaiser just kept digging and He came back and won the match some how and then he won the Tournament.. I thought that was a pretty remarkable thing and I was lucky to be standing there watching it..
3. Who do you find the hardest to defeat and why? ANSWER: At different times it has been different people.. All the great players have been tough to beat at some time or another.. Tom Spear at one time was harder than anyone probably because he was so very disciplined and I was not at the time, we were young.. But that is no longer a problem. 4. OR Who do you think has the best game and why? ANSWER: Again this changes from year to year.. Sometimes it has been Tom Spear, Terry Moore, Doug Fury, Fredrico Collingnon, The list goes on and on.. You need all the tools to be dominating but eventually people will figure you out and find weaknesses so you have to change or start loosing.. That is why I have stayed so long because my game has always changed with the times..You have to evolve with the game..
1. What is your day time job? Or is foosball your only way of getting income? ANSWER: Yes I work for a private employer that is a friend of mine auditing city records.. I keep our computer system up and running and also have other tasks..
2. 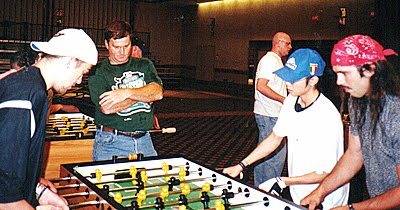 How old were you when you first started playing foosball... when and where? 3. How many hours do you practise a week? ANSWER: Right now not very much.. maybe 3 hours a week but when a big tournament rolls around I put more energy into it. 20 hours a week when I was younger for a few years.. There need to be a time when you eat and drink and sleep foosball in order to master the game I believe.. At least for me..
4. Why do you feel that the rollover should not be legal? You and Moore always get at each other in the newsgroup, why? ANSWER: Because the shot was never voted on by the players under the rules.. It was allowed because Tornado/the company said it was going to be legal.. That was the first reason.. The second was that it made the game too easy under pressure.. It use to be that the fun of being under pressure was loosing the feel of a shot and maybe missing because of nerves.. But because the shot is not held in the hand and there is no touch to the shot, it is choke proof..Very hard to misexecute and that makes the game easy and boring in my opinion. Not a real test of someones mastery over pressure. These are the basic reasons. There are more but I try not to dwell on it anymore. 1. Why did you decide to partner Fredrico? ANSWER: I remember watching Fredrico playing with someone from Europe and thinking to myself that if he had a player from the United States help him with our style that he could be very good.. At that time there was not much friendship between the two countries on the foosball table, many arguments and cheating going on, and I thought it might also help cure that problem... I could see that some of the players here were afraid of the European Front toe shot, so I thought it would be a great experience and a good thing for both of us.. I never imagined what a great friend I found in Fredrico and Ingrid his girlfriend also.. They are great people and we have something special together on the table.. I know we have both learned from it. 2. Is there any special mental preparation or practice style that you would advise to do before major tournaments? 4. When was the first time you won your first worlds? 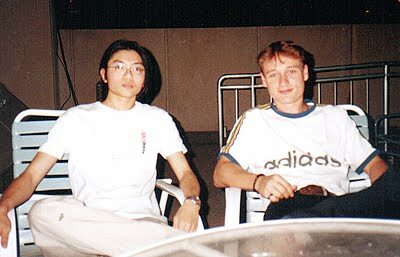 How old were you at that time? ANSWER: My birthday is August 17 1960... My first World Championship was September 4 1977.. About 3 weeks after my 17th birthday. 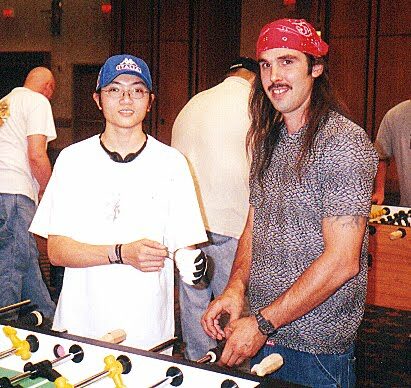 5. Who had the biggest impact on you during your foosball career? How? ANSWER: Mike Bowers and Tom Spear.. Mike also a World Champion was my mentor and like my guide and Tom was my Friend and foe and made me learn the hard way.. He was very Disciplinned and I was not..So after I lost to him a few times I studied what he did and learned how to apply it to my world.. I have always been very open to learning anything new.. I still learn from anyone, even rookies.. Just look for things that work and that have a special appeal or trickyness to them and learn it..
1. Todd, how do u not give away b4 u shoot? need practise? Forcing yourself or what? ANSWER: It takes practice with someone standing with you and they should be next to your right side at first with their hand inches from your shoulder.. Have them watch your hands and shoulders. If you move before you shoot they should touch you on the shoulder before you start your shot. After a while you can tell by yourself and then you don't need anyone else to help you.. When I am shooting and someone races me to a hole easily, It is usually because I have given my shot away with my body or shoulder. Because I practice not doing it often, it is easy for me to correct this in a match with a simple thought of being conscious of it. I simply tell myself to keep my body quiet. It is something that I often have to remind myself at tournaments when I am getting blocked..
2. Is the shoulder movement necessary in providing speed to a pull shot? What if a player is used to it and changing to the arms only pull shot will change his shot totally...? How would u advise? ANSWER: You have to move your shoulder a little but most people make the mistake of leading or leaning with the shoulder before the ball moves just slightly and goalies see it even when they are not looking for it.. You don't really need it for speed but you do need a little for power... It is a body language that you have to learn to hide.. A lot of fooling people in this game has to do with learning how to use fake body language and also using no body language.. It would be like if you were going to hit someone with your fist. If you lean into it with a mean looking face, they will see it coming and block or duck.. lol But if you look casual like you are just walking by and then strike, they will not see it coming. Many of my quick shots are done using very quiet body moves as if I am just lightly rolling the ball over to set it up.. Or they are done with some kind of fake.. Either way works..
ANSWER: Build a pull shot around a long. If my long is hitting well then the rest of the holes are much easier to see and hit. I don't practice it much anymore but I use to practice it very often.. Such as, Put the 2 man just past the big dot about 1/2 inch so the long is still pretty big.. Now make sure you have plenty of balls and that you are on a table where they keep coming to the rack or maybe a bucket of 50 balls will work also. Get a clock and shoot as many longs as you can in 1 minute and 30 seconds.. My record is 47. Do this a few times a day to build strength and to help get a good feel for the long. Set them 1 at a time by hand.. It is not easy and is tiring. Also practice on the goalie lead defence but taking your time and shooting on long counts like 7-12 seconds and keeping your body very still, this includes your fingers on both hands until you make 25 on a 2 inch hole.. As you get better, make the hole smaller. Use your imagination to make it fun. You can do the same with all the holes and then you can rotate the holes every shot or however you like. foosball.info would like to thank Todd Loffredo for taking the time to answer these questions and also Hussein, for making this possible. Thank you VERY much!